The Crashing Witch Door Cover includes one 30" by 5' polyethylene sheet that fits most standard sized doors. Good for indoor and outdoor use. We can't always straighten up and fly right - even with magical powers! This kooky character and her faithful feline companion seem to have made a crash landing into your front door - or any other door you like! 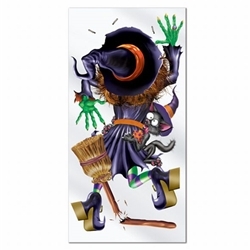 Liven up your Halloween celebration with the Crashing Witch Door Cover.